I bookmarked the recipe for these homemade tortillas from Foods for the Soul awhile back and was hankering to make them. However, I wanted to wait for a day I could dedicate some time to it, since the process seemed a little bit time consuming, and I wanted to make enchiladas with my lemon mashed Great Northern beans (since Zak is obsessed with them and is constantly making them for himself or asking me to make them), which is a bit more labor intensive than a simple taco or burrito. My suspicions were correct – this recipe is quite time consuming. I spent an hour and half in the kitchen preparing the filling, the red enchilada sauce, and getting the tortilla dough made and rolled out, and another 15 minutes cooking the tortillas, stuffing them, and getting them in the oven. Now, I’m the sort of sicko who enjoys spending hours in the kitchen. 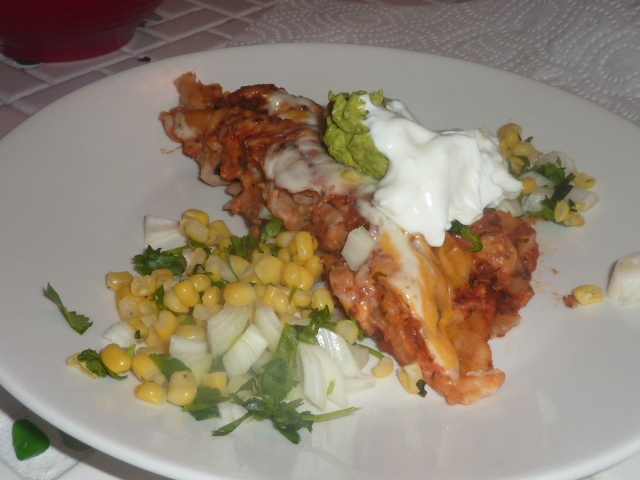 Luckily for you non-insanos out there, this is a dish that can be prepared one step at a time (make the filling and refrigerate it for a few days, make the sauce the next day and keep it refrigerated for a couple of days, assemble the enchiladas and keep them in the fridge for a day, etc.) or prepared ahead of time and reheated with delightful results. Even so, I thought it was worth it. This was creamy, cheesy, and flavor-packed. The enchilada sauce had some nice smoky spice from the chipotle in adobo which paired really well with the sweet corn salsa and creamy tang of the lemon mashed Great Northern beans. Overall, this recipe was quite healthy. The cheese isn’t the best thing ever for one’s arteries, but I rationalize that this makes 5 enchiladas, which is two full meals or more for us. Other than that, it was completely vegan and absolutely delicious! Furthermore, it was immensely gratifying to make my own filling, tortillas, and sauce from scratch. Combine flour, salt, baking powder, and cumin and whisk to combine. Add corn oil and work into flour with fingers until the mix is the consistency of a coarse meal. Slowly add the water and work mixture with hands until a sticky dough is formed. Turn dough onto a floured surface. Knead for 2-3 minutes until smooth and elastic. Shape into 7-8 evenly sized balls. Roll dough balls out using a floured rolling pin one at a time until 1/8″ thick. You may need to stretch using your hands. You also may need to spend a few weeks in the gym before trying this recipe, because goodness, was I ever exhausted by the time these hit the pan! Heat a 10″ cast iron skillet over medium-high heat. Lay one tortilla in the pan and cook for 30-60 seconds. Once bubbles begin to form, flip the tortilla and cook another 30-60 seconds. Turn out onto a place and repeat with remaining tortillas. For this recipe, you do not want the tortillas to get crispy – just cooked and softened. In a medium sauce pan, heat olive oil over medium heat. Add onion and sauté until translucent, 6-8 minutes. Add onion and cook until fragrant, 1-2 minutes. Add chipotle in adobo sauce, paprika, marjoram, basil, parsley, tomato, tomato paste, and water. Whisk to combine all ingredients. Reduce heat to low and simmer for a minimum of 15 minutes and up to an hour until ingredients are combined. If desired, transfer to a food processor and puree. In a large sauce pan, heat enchilada sauce, thinning down with water if necessary. Place each tortilla in enchilada sauce and let sit 30-60 seconds per side to absorb some of the sauce. Set aside. Mix together lemon mashed great northern beans and 1/4 cup of each type of cheese. Pour 1/2 of remaining sauce in a medium casserole dish. Take each tortilla and fill with about 3/4 cup lemon mashed great northern beans. Roll into a tube shape and place, seam side down, in casserole dish. Repeat with remaining three tortillas. Pour remaining sauce over enchiladas. Top with remaining cheese and cover casserole dish with tinfoil. Bake 30-35 minutes. Remove tinfoil and bake another 5-10 minutes until cheese is bubbling and golden brown. Serve with homemade guacamole, corn and cilantro salsa, and plain Greek yogurt.